While in Sydney earlier this month, Anatara Lifesciences (ASX:ANR) CEO Steve Lydeamore sat down with Stuart Roberts at Pitt Street Research, one of Australia&apos;s most experienced providers of equity research for ASX-listed small and mid cap companies. While in Brisbane this week, Anatara Lifesciences CEO Steve Lydeamore (ASX:ANR) sat down with Scott Power, Senior Analyst at Morgans Financial Limited, Australia&apos;s largest national full-service retail stockbroking and wealth management network. 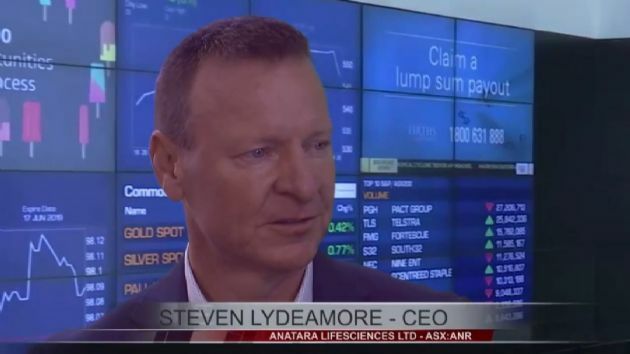 Anatara Lifesciences Ltd (ASX:ANR) CEO Steven Lydeamore, recently appointed to the company, is interviewed by ABN Newswire on the development of Irritable Bowl Syndrome (IBS) dietary supplements to address the growing need for a product that addresses the full range of IBS symptoms. PAC Partners Equity Research has released its latest research and valuation report on Anatara Lifesciences (ASX:ANR). The report provided a BUY rating and a 12-month price target of $1.40 per share. Pitt Street Research has released its latest initiating research and valuation report on Anatara Lifesciences (ASX:ANR). The report provides a $1.34 per share base case and a $3.61 optimistic case using a probability-weighted DCF valuation approach. Anatara Lifesciences Ltd (ASX:ANR) is pleased to release its Appendix 4D financial report for the half year ending 31st December 2018. Anatara Lifesciences (ASX:ANR) is pleased to release a copy of the presentation that Chief Executive Officer, Mr Steven Lydeamore, will be presenting at the Proactive Investors Australia CEO Sessions and the Wholesale Investor&apos;s Emergence 2019 conferences this month. This month, Anatara&apos;s CEO, Steve Lydeamore will be presenting to investors at events in Sydney and Melbourne. We would like to extend to you the invitation to attend. 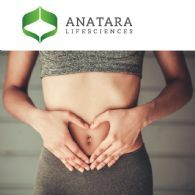 Anatara Lifesciences Ltd (ASX:ANR) is pleased to report positive efficacy data from its in vitro Proof of Concept studies of its Gastrointestinal ReProgramming product. GaRP is a unique natural dietary supplement designed to restore and maintain a healthy human gut and microbiome. Anatara Lifesciences Ltd (ASX:ANR) is pleased to release its Appendix 4C for the quarter ending 31st December 2018. The Company&apos;s cash position at the end of the quarter stood at $1.5m. The Company also had $4,500,000 in deposits with terms of greater than 90 days. Expenditure during the quarter was in line with forecast. Anatara Lifesciences (ASX:ANR) is pleased to announce the appointment of Dr. David Brookes as Non-Executive Director and Chair of the Audit and Risk Committee, effective from 23 January 2019. Anatara Lifesciences (ASX:ANR) is pleased to announce that it has received $1,249,299 from the Australian Taxation Office under the Federal Government&apos;s Research and Development Tax Incentive scheme. 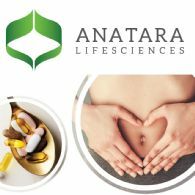 Anatara Lifesciences Ltd (ASX:ANR) provides the Company&apos;s Chairman Address to Shareholders. Anatara Lifesciences (ASX:ANR) is pleased to announce that it has appointed Mr Steven Lydeamore as Chief Executive Officer, effective as of 3rd December 2018. 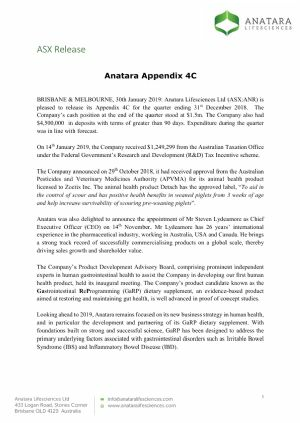 Anatara Lifesciences (ASX:ANR) is pleased to release its Appendix 4C for the quarter ending 30th September 2018. The Company&apos;s cash position at the end of the quarter stood at $7.1m. Anatara Lifesciences (ASX:ANR) is pleased to announce that the Australian Pesticides and Veterinary Medicines Authority has registered Detach(R) with the approved label, "To aid in the control of scour and has positive health benefits in weaned piglets from 3 weeks of age and help increase survivability of scouring pre-weaning piglets". Anatara Lifesciences (ASX:ANR), a company focused on commercialising innovative products for gut health, is pleased to announce the formation of its Product Development Advisory Board. The Advisory Board consists of five key external experts: Dr Rebecca Burgell, Dr Jakob Begun, Prof Barry Campbell, Assoc Prof Simon Keely and Prof Peter Gibson, who will serve as the Chairman. 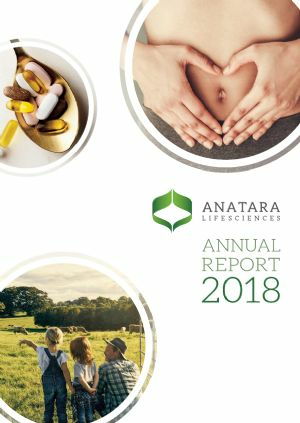 Anatara Lifesciences (ASX:ANR) is pleased to release its Annual Report, for the year ended 30th June 2018. Anatara Lifesciences Ltd (ASX:ANR) announces that Executive Chairman, Dr Mel Bridges has informed the Board of his wish to retire from his role at Anatara with immediate effect and the Board has formally accepted his resignation. Anatara Lifesciences (ASX:ANR) is pleased to release a new investor presentation following the announcement that Anatara had established an exclusive licensing agreement with Zoetis Inc., the leading global animal health company, for the worldwide development, manufacture, distribution and marketing of Detach(R). Anatara Lifesciences (ASX:ANR) is delighted to announce an exclusive licensing agreement with Zoetis Inc., the leading global animal health company, for the worldwide development, manufacture, distribution and marketing of Detach(R) as a non-antibiotic approach to aid in the control of diarrhoeal disease (known as scour) in livestock and in horses. Anatara Lifesciences (ASX:ANR) today released its Appendix 4C financial report for the quarter ending 31st March 2018. Anatara Lifesciences (ASX:ANR) today released its Appendix 4D financial report for the half year ending 31st December 2017. Anatara Lifesciences (ASX:ANR) has achieved a significant milestone in the United States of America after receiving a "complete" letter from the US Food and Drug Administration for the Technical Section of its Human Food Safety submission. The HFS is a major component of a New Animal Drug Application which is currently underway and is necessary for enabling the marketing of Detach(R) in the US. Anatara Lifesciences (ASX:ANR) is pleased to announce that it has received $1,230,329 from the Australian Taxation Office under the Federal Government&apos;s Research and Development Tax Incentive scheme. At the Australasian Pig Science Association Conference in Melbourne this week, Dr Trish Holyoake & Dr Tracey Mynott presented a poster highlighting the comparable efficacy of a single dose of Anatara&apos;s (ASX:ANR) Detach(R) product to in-feed Zinc oxide in reducing diarrhoea and antibiotic treatments in post-weaning piglets. Anatara Lifesciences Ltd (ASX:ANR) provides the Chairman&apos;s address to shareholders. Anatara Lifesciences (ASX:ANR) CSO, Dr Tracey Mynott, was recently invited to present at the Translational Research Institute&apos;s Science Business Inspiration Series. The series was launched with Session 1 "The whole journey: from idea to reality". 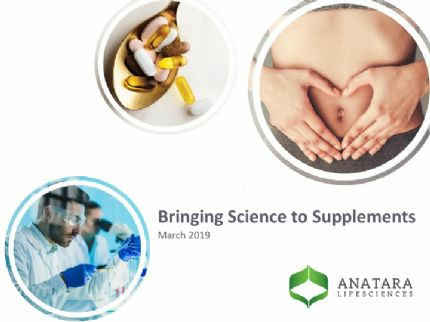 Anatara Lifesciences (ASX:ANR) is pleased to release its latest institutional roadshow presentation and market update that will be delivered to investors this week by CEO & Chairman, Dr Mel Bridges and Co-Founder and Chief Scientific Officer, Dr Tracey Mynott. 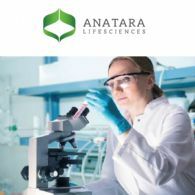 Anatara Lifesciences Ltd (ASX:ANR) provides the Company&apos;s Annual Report 2017 Update. 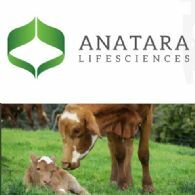 Anatara Lifesciences Limited (ASX:ANR) has today undertaken to extend by 12 months the expiry date of 250,000 Options which Anatara issued to the Pork Cooperative Research Centre in 2015. Anatara Lifesciences Ltd (ASX:ANR) is pleased to announce that global animal health company, Zoetis Inc. has exercised its option to negotiate a commercial agreement for the worldwide development, distribution and marketing of Detach(R), with terms to be agreed. 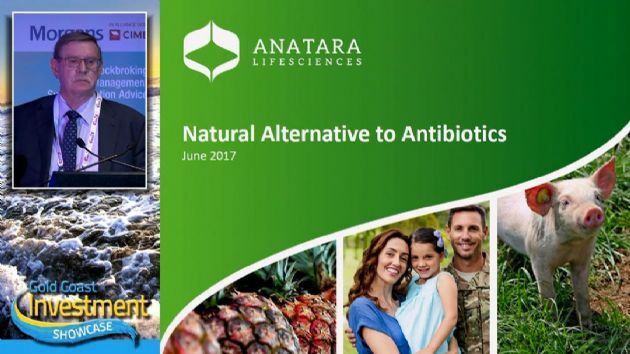 Anatara Lifesciences (ASX:ANR) is pleased to release to investors a copy of the presentation for the Gold Coast Investment Showcase (June 21st & 22nd 2017). Wilsons maintain a BUY rating and $1.66 price target. Anatara&apos;s recent stock underperformance has simply reflected a slow quarter for news in the lead-up to a significant inflection point in the 2H. Anatara Lifesciences Ltd (ASX:ANR) is pleased to provide investors with an update on recent progress. An oral drench to protect piglets from gut infection could soon be available to pig farmers. It&apos;s been developed by scientists and is made from pineapples - taking antibiotics out of the food chain. Anatara Lifesciences Ltd (ASX:ANR) is pleased to provide the Company&apos;s Half Yearly Report for the period ended 31 December, 2016. Anatara Lifesciences Ltd (ASX:ANR) is pleased to announce that it has received a second payment under the exclusive Evaluation and License Option Agreement with the leading global animal health company Zoetis Inc. (NYSE:ZTS) for Detach(TM), Anatara&apos;s non-antibiotic anti-infective product. NDF Research yesterday released its initiation report on Anatara Lifesciences Ltd (ASX:ANR). The report provided a valuation at $2.22 per share base case and $5.94 per share optimistic case using a DCF approach, with a target price of $4.00 per share sitting midpoint of their valuation range. 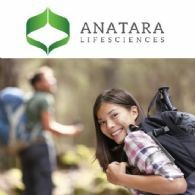 Anatara Lifesciences Ltd (ASX:ANR) is pleased to release its updated investor presentation. Anatara Lifesciences Ltd (ASX:ANR) is pleased to provide the company&apos;s AGM Presentation held on 15 November 2016. Anatara Lifesciences Ltd (ASX:ANR) is pleased to provide the company&apos;s latest Chairman&apos;s Address to Shareholders at 2016 AGM. 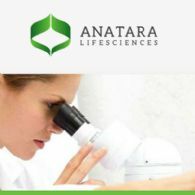 Anatara Lifesciences Ltd (ASX:ANR) directors present their report on the consolidated entity consisting of Anatara Lifesciences Ltd and the entities it controlled at the end of, or during, the year ended 30 June 2016. Anatara Lifesciences Ltd (ASX:ANR) is pleased to announce that it has received $420,460 from the Australian Tax Office for the Research and Development (R&D) Tax Incentive. This refund is from Anatara&apos;s 2014-15 research activities and future refunds will increase significantly. The company is in the process of finalising its 2015-16 tax claim. Anatara Lifesciences Ltd (ASX:ANR) is pleased to release its latest institutional roadshow presentation and market update that will be delivered to investors over the next two weeks by CEO & Chairman, Dr Mel Bridges and Co-Founder and Chief Scientific Officer, Dr Tracey Mynott. Following the United Nations General Assembly (UNGA) High-Level Meeting on Antimicrobial Resistance (AMR), Anatara Lifesciences (ASX:ANR) confirmed its commitment to fighting AMR, starting with the food chain. Anatara, which is developing therapeutics for gastrointestinal diseases in production animals and humans announced today it had submitted an application to register Detach(TM). Anatara Lifesciences (ASX:ANR) is pleased to announce that it has lodged its application for approval to register Detach(TM) with the Australian Pesticides and Veterinary Medicines Authority (APVMA). Detach(TM) is a natural, non-antibiotic alternative for the control of diarrhoea in piglets. 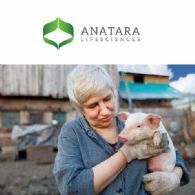 Anatara Lifesciences (ASX:ANR) is pleased to announce the successful completion of its pivotal Target Animal Safety (TAS) Study for DetachTM, the Company&apos;s lead product for the control of diarrhoea in piglets. Anatara Lifesciences Ltd (ASX:ANR) today released its Appendix 4E for the period ending 30th June 2016. Chairman & CEO, Dr Mel Bridges said, "We are extremely pleased to report a positive cash flow for the last quarter, reinforcing a strong balance sheet and cash position. Our cash position allows Anatara the flexibility to execute on moving both our animal and human applications forward to commercial launch," Dr Bridges added. 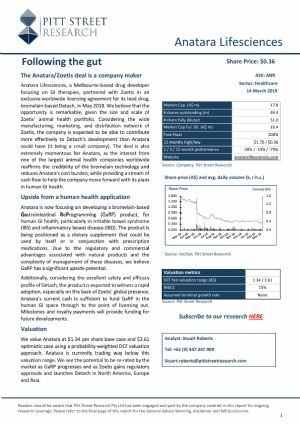 Anatara Lifesciences (ASX:ANR) releases its latest institutional roadshow presentation and market update. This week CEO & Chairman Dr Mel Bridges and Co-Founder and Chief Scientific Officer (CSO) Dr Tracey Mynott will be conducting a roadshow updating existing and potential new institutional investors and analysts. 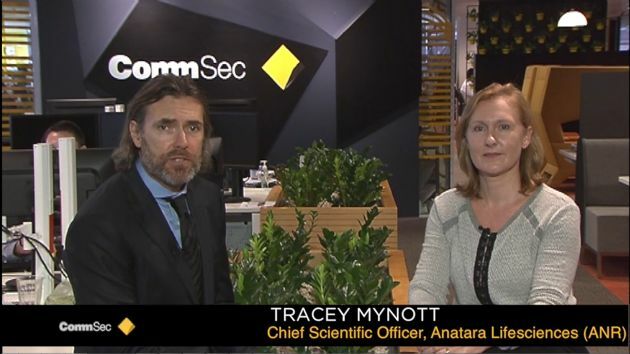 Anatara Lifesciences Limited (ASX:ANR) Chief Scientific Officer, Dr. Tracy Mynott, speaks with Tom Piotrowski at CommSec&apos;s The Executive Series, by Commonwealth Bank Australia (ASX:CBA). Anatara Lifesciences (ASX:ANR) announces changes to its management team, including the retirement of Dr Paul Schober as CEO, transition of Dr Mel Bridges into a combined CEO / Chairman role as well as the appointment of Dr Mike West as COO and Ms Kylie Davis as Clinical Trials Manager. Anatara Lifesciences (ASX:ANR) is pleased to release a copy of the presentation that Chairman, Dr Mel Bridges presented at the Finance News Network CEO Conference and the Gold Coast Investment Showcase this week. 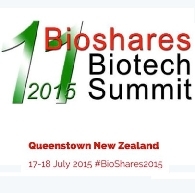 Australian and New Zealand biotech investors are set to hear from a top line up of speakers from ASX-listed life science companies, as well as several private firms and international businesses, in July, at the 11th Bioshares Biotech Summit.